There is a new way to personalize vehicles with Pic the Gift’s customized seat belt protector pad. The Pic the Gift personalized Seat Belt Protector is great for those who want to add their own flare, along with comfort while on the road. Pic the Gift has made a new addition to their customized vehicle accessories, the Personalized Seat Belt Protector. Great for those who want to add their own flare, along with comfort while on the road. The Seat Belt Protector is made out of neoprene, a synthetic rubber that provides stability and maintains flexibility over a wide range of temperature. The seat belt pad is single sided and measures 7”x9.25” with an design area of 8.625”x3.375”. When folded around a seatbelt, the pad measures 2.5” wide. Seat belt protectors are to help avoid any discomfort from rubbing or irritation that may be caused from a seat belt. Providing more than just comfort, the protectors are also used to keep shirts and jackets wrinkle free over a long drive. There are endless possibilities for customers to personalize their own seat belt protector using Pic the Gift’s online designer. Customers have the ability to create their own designs with custom fonts, backgrounds, uploaded photos from their computer, Facebook, or Instagram and more. The designer provides stock designs, templates, images, and special effects for customers to use in their design. 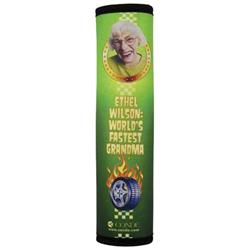 For over 50 years, Pic the Gift has manufactured in the USA high quality personalized products and picture gifts. The company is based in St. Louis, Missouri, which allows them to ship their products in 4 days or less. They are a Green company and use biodegradable water based ink and recycles 100% of all components used in production process. Pic the Gift enjoy making their customers happy by creating unbelievable personal gifts. For more information please visit http://www.picthegift.com/.